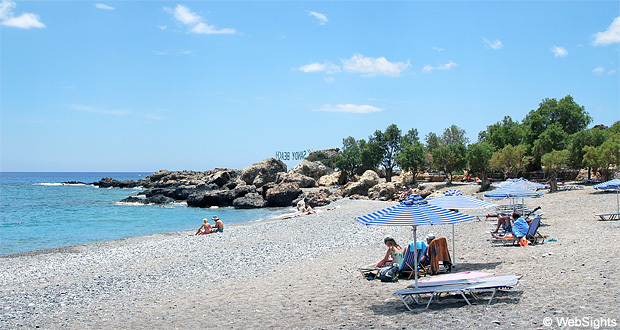 Gialiskari refers to the three beaches located near the remote village of Anidri in southwestern Crete. Anidri can be found 3-4 kilometres west of the cosy holiday town of Paleochora. Two of the beaches share a peninsula, whereas the third and best beach is located by itself. The official name of this beach is Ammoudia, but it is commonly referred to as Gialiskari. Gialiskari is a proper natural beach and visiting it requires a trip down a bumpy gravel road. The reward for this less-than-pleasant trip is a beautiful beach surrounded by mountains and small trees on the beach itself. Although the sand is a mixture of stone and gravel, the edge of the water is fairly free of stones. Sun loungers and parasols are available to rent and the beach has toilet access. At the far end of the beach is a section reserved for nudists, which is usually well-frequented. That said, most of the time there is plenty of space on the beach. Gialiskari was popular amongst hippies in the 70s. They often walked in from Paleochora with enough supplies to last them a few days and spent the weekend around a campfire. The water deepens quite quickly and there are a lot of stones on the beach. 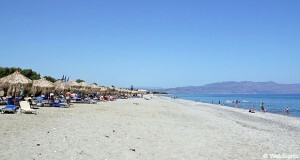 The beach in the nearby town of Paleochora is far more child-friendly. There are no water sports at the Gialiskari beaches, but the clear water is ideal for snorkeling. There is a cosy, little beachside café at the beginning of the beach. 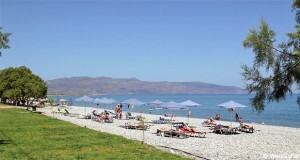 The two beaches located on the peninsula are also equipped with a café. Located 3-4 kilometres west of Gialiskari, the closest holiday town is Paleochora. A lot of people return to this beautiful, cosy town again and again. There is a wide selection of unique shops in the old town, not to mention plenty of restaurants that offer the traditional Greek dishes. All three beaches shown on the map are commonly referred to as Gialiskari. The best and most frequently visited beach is located in the top right corner, as “Sandy Beach”, whereas the other two beaches can be found on either side of the small peninsula.